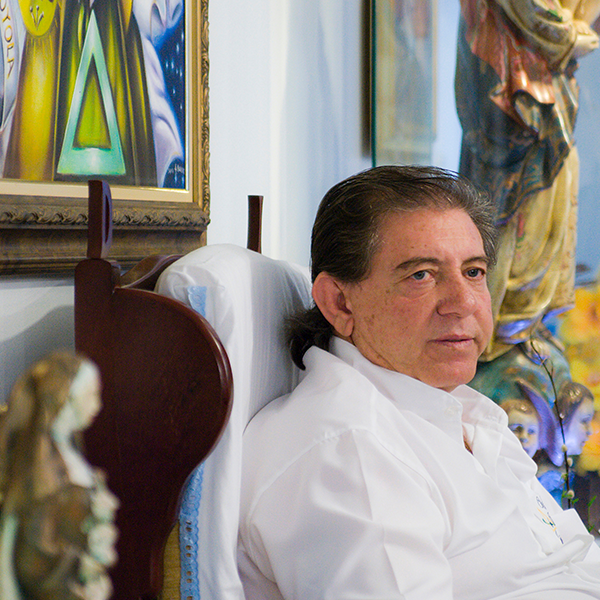 Joao Texeira de Faria, also known as John of God, is a world famous spiritual healer from Brazil who has been attributed to many miracles that science cannot explain. His work attracts both controversy and acclaim. 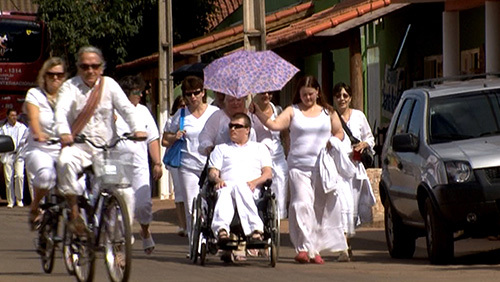 For the past 30 years, thousands of people from all over the world have been flocking to his remote village in Brazil in search of cures for illnesses Western medicine offers little hope. This compelling documentary follows Lya from Australia with terminal cancer, and Fred from USA with HIV, on a healing odyssey to Brazil. Will they be lucky enough to receive a miracle? This is an intimate human story that explores the healing powers of the heart. I have always been interested in the use of energy for healing. When my friend Lya with terminal breast and bone cancer decided to go to see John of God, I asked if I could document her experience. When I told another friend Fred Porter from Los Angeles that I was going to Brazil he decided to come too. 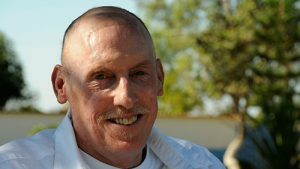 He had been living with HIV for many years and wanted to try a different approach than western medicine. This film is the story of their journey. 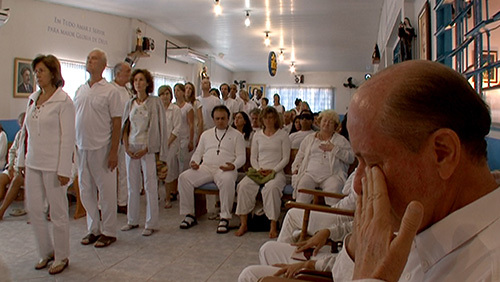 When you first arrive at the healing centre called the Casa Dom Ignacio in the town of Abadiania, some would say it looks like a cult. 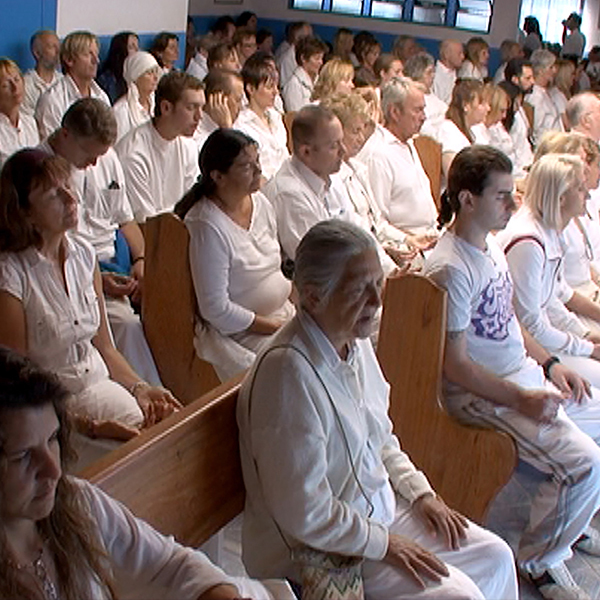 Hundreds of people dressed in white are immersed in meditation and prayer where John of God sits and receives people queuing in long lines. John of God is known as a trance medium. He is said to work with spirits who do the healing through him. He always says “I am just a man, it is God who heals”. His work draws as many critics as supporters, and has been studied by many doctors, scientists and experts in paranormal phenomena. Like many spiritual traditions, the belief system here describes our physical existence as temporary, our soul as eternal, and our spiritual evolution as primary. We follow Lya and Fred through the healing processes at the Casa. Most of the work takes place in the main healing room called the Current Room, where energy is the modality through which the healing occurs, similar to many eastern medical practices popular today such as acupuncture or reiki. The primary treatment is meditation and prayer as well as invisible spiritual surgery which from the outside looks more like a focused meditation. While John of God is known for his bizarre physical spiritual operations that appear to be outside the realms of western medical understanding, they are actually a very small part of the treatment here and are rarely performed. My camera captures some of them when a few brave souls put up their hand and ask for these treatments. He cuts skin and scrapes an eyeball with a kitchen knife, all without anesthetic, with little bleeding or resulting infection. While skeptics dismiss these as magic tricks they are said to be signs of spiritual intervention. Interviews with people having these operations describe intense experiences of increased energy and wellbeing. While initially many come here with the hope that John of God will cure them, as I gain a deeper understanding of what is really happening here, healing is actually considered a collaborative process. 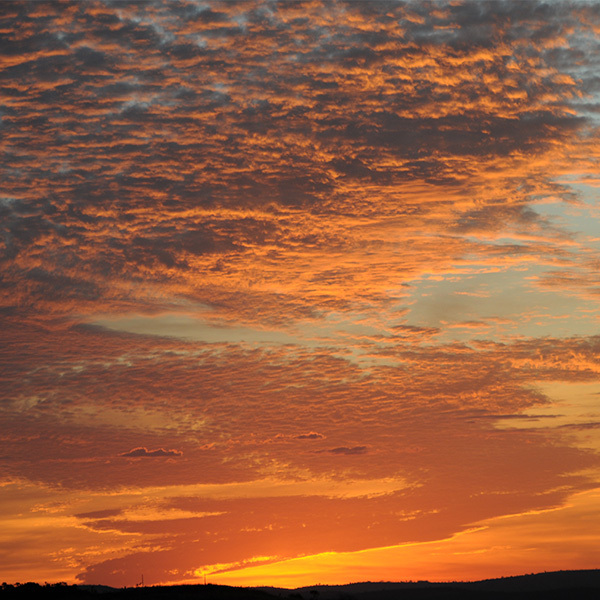 The individual is asked to contribute to their healing through looking within for answers. To open the heart, forgive and have gratitude, common in many spiritual traditions, are seen to be a source of healing, that can also influence healing on a physical level. Many scientific studies now show that how we think and feel affect our physiology. While Lya and Fred’s journey are central to the film, I meet many others on their healing journey, with a range of experiences and reasons for coming here, not just physical illness. Some have extraordinary stories of physical healing; others have no result at all. Some have no physical improvements but are experiencing transformation on an emotional level. Some come to experience spiritual connection or to assist a loved one preparing for death. Like all spiritual traditions death is considered a doorway into the spirit world, and a natural part of life to be embraced. A Quest To Heal - Beyond The Physical is a journey of discovery into what it means to heal. It offers audiences new ways of looking at the healing journey beyond the western medical model of curing the physical body. I hope this film will help people on their healing journey offering ways they can help themselves, whether they are suffering from a physical illness, a mental or emotional crises or preparing for death. A Quest To Heal – Beyond The Physical shows us that healing can be a self-empowering journey that begins from within, encompassing our mind, body and soul. 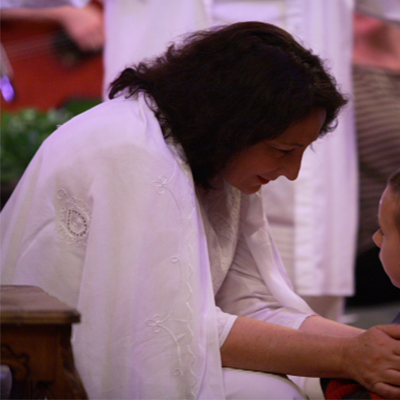 It inspires us to consider a healing of the future that integrates both western medicine and spirituality. Prof Marc Cohen is one of Australia’s pioneers of integrative and holistic medicine. He is a registered medical practitioner with degrees in western medicine, physiology and psychological medicine and PhDs in Chinese medicine and biomedical engineering. He is currently President of the Australasian Wellness Association and Professor of Health Sciences at RMIT University where he leads postgraduate Wellness Programs and supervises research into wellness and holistic health including research on yoga, meditation, nutrition, herbal medicine, saunas, hot springs, lifestyle, elite athletic performance and the health impact of pesticides, organic food and detoxification. In addition to major textbooks on herbs and natural supplements, and the global spa industry, Professor Cohen has published more than 90 academic papers and written multiple books, chapters and articles on holistic health. His impact on the field has been recognised by multiple RMIT Media Star Awards as well as the inaugural Award for Leadership and Collaboration from the National Institute of Complementary Medicine. 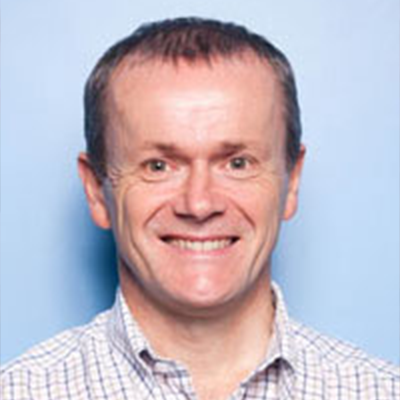 Dr. Craig Hassed is a general practitioner and senior lecturer in the Monash University Department of General Practice in Melbourne Australia where he has been teaching at both undergraduate and post-graduate levels since 1989. He has been instrumental in introducing a variety of innovations into medical education and practice with an emphasis on the application of holistic, integrative and mind-body medicine in medical practice, and reconnecting different knowledge systems, in a way which is grounded, balanced, scientifically valid and clinically effective. He is an internationally recognized expert in mindfulness who has published extensively in the areas of mind-body medicine and mindfulness. He is a regular speaker in Australia and internationally on these topics and is regularly invited to contribute to a variety of community and professional groups. Rick Sheff, MD is a family physician with over thirty years of experience in medicine. 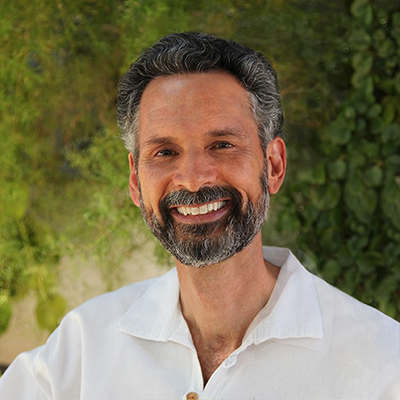 Known as a doctor’s doctor, his career has taken him from practicing family medicine to serving as a physician executive, to helping integrate complementary and alternative medicine with conventional medicine. He now chief medical officer of The Greeley Company, a highly respected healthcare solutions company dedicatalso the authroed to helping physicians and hospitals provide outstanding care to the communities they serve. In addition to his lifelong commitment to help heal healthcare, he is dedicated to building the coming new paradigm that integrates science with spirituality. He is the author of several books including Joyfully Shattered A Physicians Awakening at the Crossroads of Science and Spirituality, and Doctor confidential: Secrets Behind the Veil. 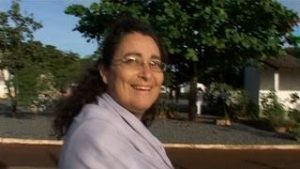 Caterina Pellegrino was born with profound knowledge of energetics and has worked as an intuitive healer, spiritual counselor and color therapist for the last 30 years. She has treated many for their illnesses, and has practiced in clinics in Florence, Italy, Chicago and Sydney, Australia. She was the first westerner to visit John of God 25 years ago, and worked alongside him for many years. She brought his work to the world through publication of the book “The Miracle Man”. 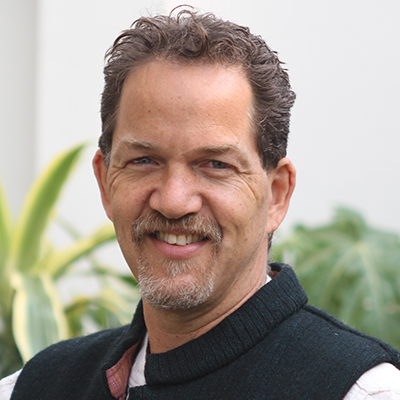 Peter is a Clinical Naturopath, and Natural Therapist of 25 years which crosses science based holistic health with vibrational medicine to achieve optimum outcome. 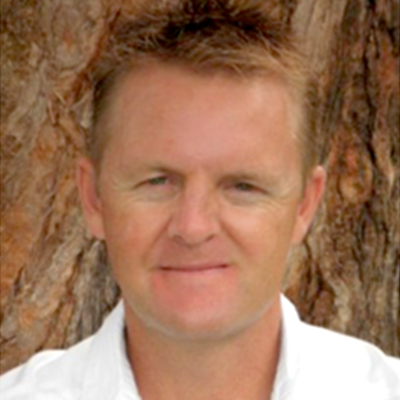 He currently occupies the role of Holistic Health Services Manager at The Golden Door, a leading Health Retreat in Australia of which he introduced and facilitates the Casa crystal light bed, the first of its kind to be utilized as a healing modality in a Health Retreat within Australia. 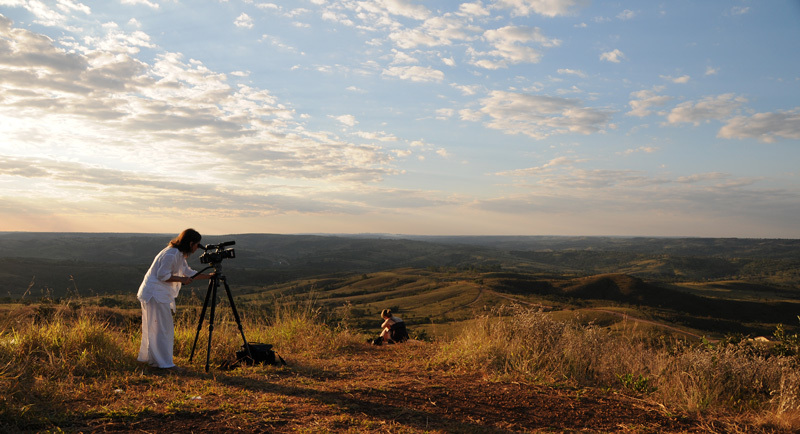 Michelle Mahrer is an award winning filmmaker with a dance background, who specialises in films about dance and spirituality encompassing documentaries and short films. Her most well known documentaries are DANCES OF ECSTASY, a sensory journey into the world of ecstasy experienced through dance and rhythm, and KURTAL – SNAKE SPIRIT, which follows the journey of Aboriginal elder Spider Snell and his family back to their traditional lands. Other television documentaries include URBAN CLAN a portrait of the Bangarra dance theatre, THE BLACK SWAN a portrait of choreographer Meryl Tankard and THE THREE BALLERINAS a portrait of stars of the Australian ballerinas Lucette Aldous, Marilyn Jones and Marilyn Rowe. 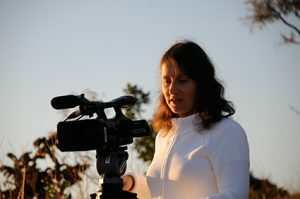 Michelle Mahrer began her career directing award winning music videos in New York where she was based for 8 years and worked with several well known artists such as Jo Cocker, Grace Jones, and Michelle Shocked. Here she met ecstatic dance pioneer Gabrielle Roth who commissioned several teaching videos of her pioneering movement meditation work called 5Rhythms dance. Her early films explored the genre of Dance Film - short films using dance specifically choreographed for the screen. These featured collaborations with Australian choreographers including DVOID a collaboration with Gravity Feed performance group, XIDU a dance film about rhythm, HORIZON featuring the work of choreographer Eva Karczag, and RIVER WOMAN, a collaboration with indigenous choreographer Bernadette Walong. 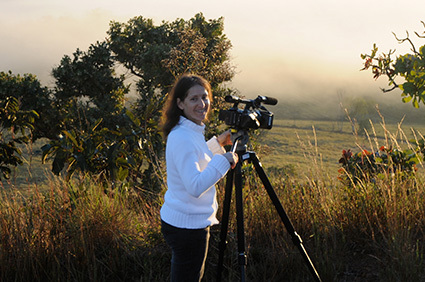 Michelle is passionate about making films that uplift humanity and enhance our quality of life. She is also a Dance therapist and 5Rhythms Dance teacher working with dance as a healing tool. She leads a vibrant dance community in Sydney called RadianceDance5Rhythms.